Become a Program Mentor with STEAMLabs! Help us bring technology and hands-on making to kids to our Fall programs being offered now at STEAMLabs and The Maker Bean Cafe! We’re looking for program mentors with availability to support staff in the delivery of our ongoing youth programs at both our downtown makerspace in Toronto and our partner, the Maker Bean Cafe at Bloor and Dufferin. We enable kids to make their wildest project ideas come true using our high tech machines (3D printers & laser cutters), electronics, woodworking tools, and more. If you are interested in being additionally considered for one-off events from time to time, please write in your general availability for Spring in your application notes. Note: We aim to reach at least a 1:5 mentor to participant ratio in all of our programs. In anticipation of our programs filling up, we will recruit enough mentor spots to maintain this ratio. However, some programs may end up being cancelled due to low sign ups and we will notify you in these cases if this occurs. The only prerequisite for volunteering is that you love helping kids bring their weird and wonderful ideas to life. We ask volunteers to arrive between 30-60 minutes prior to class, depending on the set up and briefing required. We also ask that volunteers stay to assist with pack up and participate in a debrief. If you’re ready to apply please use the online form below and we’ll get back to you as soon as possible after the deadline! Deadline to apply to be a mentor for ongoing programs is August 24th, 2018 at 11:59pm ET. We offer you all the perks of a membership, including access to space and tools. 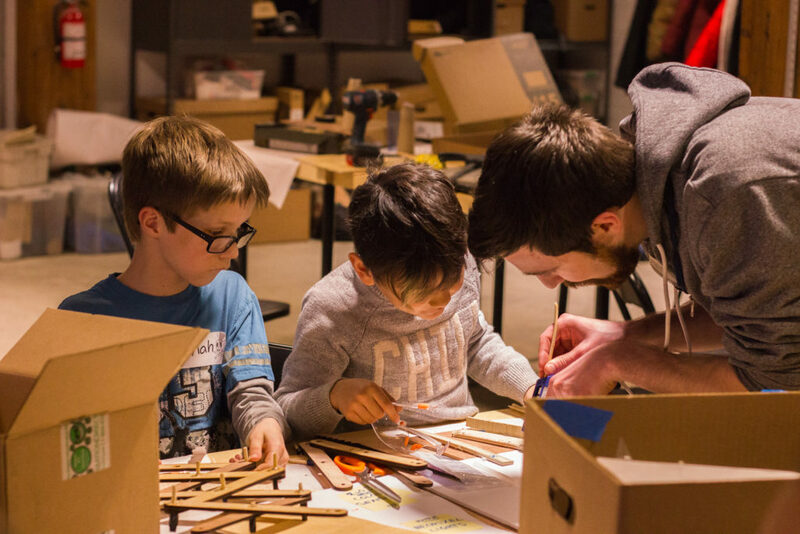 On top of that, you’ll receive free tool training, get behind the scenes experience running a makerspace, and be super-connected to the community as a representative of STEAMLabs. Applicants who apply to become a mentor for our upcoming programs must be available to attend the training sessions prior to the start of our programs. We will provide free tool training and brief you on our upcoming programs. In some circumstances, we may be able to schedule another training session, but preference is given to those who are able to make our training sessions and at least cover the program material (saving tool training for another available time). 1-2 evenings at STEAMLabs and / or The Maker Bean Cafe (based on where your mentorship placement will be.